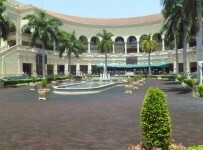 Gulfstream’s Sunday racing card includes 12 races, with a 1:15 PM first post. There are no stakes races. Saturday’s action was intense: 3 off-turf races, three 2 year-old races, and a growing Rainbow 6 jackpot of $553,928 for Sunday’s card. 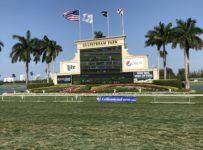 Our data from Equibase shows 8 winners of $12,030 each in a difficult handicapping day indeed. There were 61 starters in the last 6 races including two 13 horse fields. 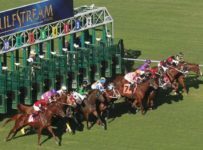 Archer Road won the Starter Stakes’ Copingaway at even money in race 10, while Bella Vincenza got the win in the Added Elegance Stakes at 2:1 odds (race 11). Jessica (20:1) won race 9, a maiden special weight, by 1-1/4 lengths to throw a wrench in the Pick late pick 5 and Pick 6 wagers. Sunday’s carryover will be $553,928 on the Rainbow 6, and the Super Hi-5 carryover will be $2,655 on race 1.